AND IT CAN BE WASHED IN HOT WATER. This gives your child the cleanest, healthiest and most comfortable pillow for the best night sleep. Other memory foams can not get wet so they can not be properly cleaned. Some other foam pillows can be machine washed in cold water, but this is not effective in properly cleaning the pillow. Example: Hot water kills 100% of dust mites, warm water 6%. 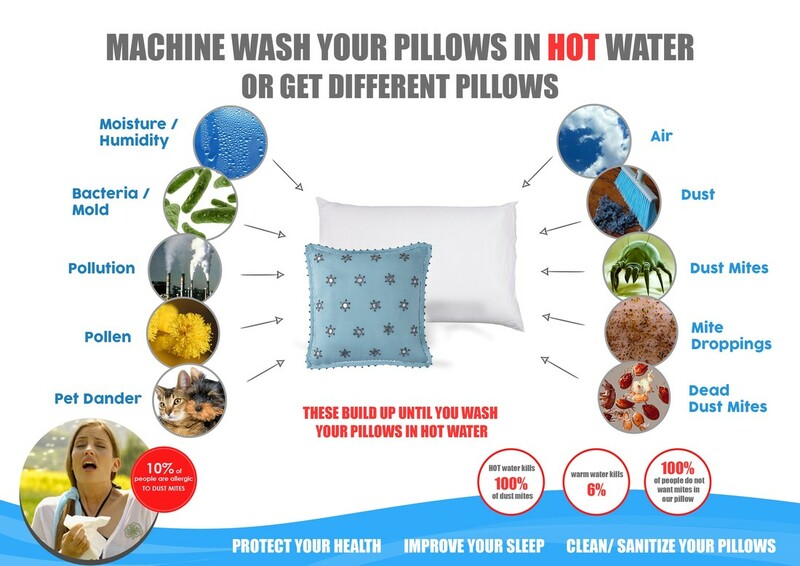 Bacteria, mold, pollen, allergens, sweat and other contaminants can also build up in the pillow. Hot water is needed for the best cleaning. Many people find high quality, high density memory foam to be the most comfortable pillows. The draw back was they get dirty and can not be washed. It took Dr. Bob's, engineers and manufacturers from 3 continents to produce our new memory foam that can not only be machine washed, but washed in Hot water. Then we added our 2 layer pillow cover with the outer layer made from organic cotton that has no chemical dyes. We do not want the child breathing next to chemical dyes. Our memory foam is certified to be free of any harmful chemicals. ​ Now it is complete.